Under the leadership of Pastor Tim and Kristal Stair, Elevate Life Church (ELC) is a contemporary, non-denominational house of worship whose mission is to help guide worshippers as they encounter God, to embrace others, and to elevate their world. 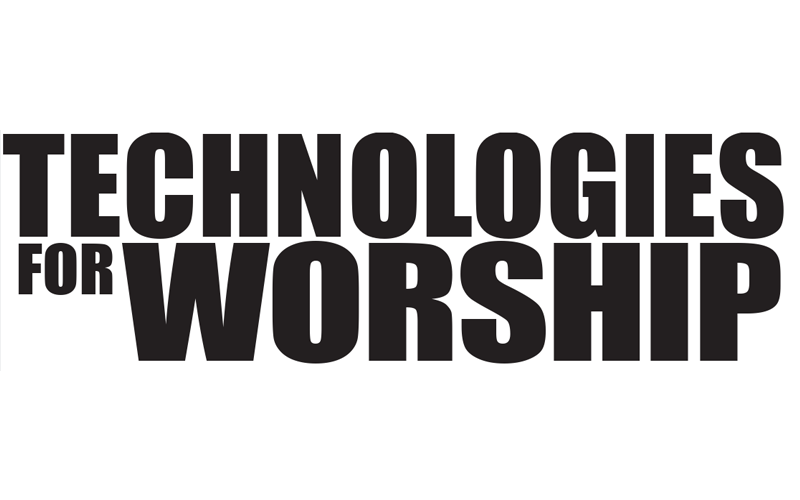 With contemporary services where music is an integral component of the worship experience, the ability of the congregation to experience every nuance of a performance while being able to clearly understand the message is crucial. 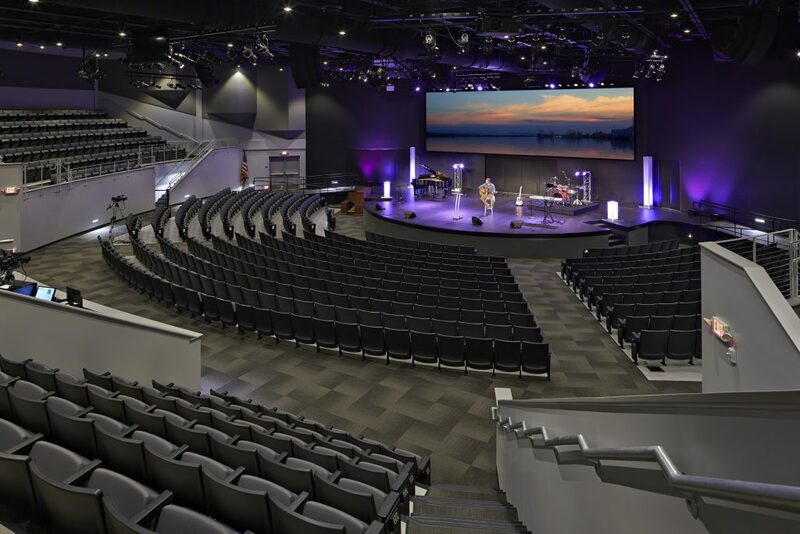 This is precisely why the church recently invested in X2 line arrays and TL118SS subwoofers drawn from the WorxAudio catalog of PreSonus® Audio Electronics, Inc. (www.presonus.com) of Baton Rouge, LA. The equipment purchase was coordinated through Guitar Center Professional (http://www.guitarcenter.com/GC-Pro/). Speaker placement has to some always been a black art – sound being a technology that you can’t physically “see” it’s not always a simple self-explanatory thing. If you are installing a new sound system in your facility, one of the biggest influences on sound quality that you can have is to have an industry professional “measure” the room response using proper test equipment. This will allow you to understand more about what sound does to the room – or maybe better put – what your room does to the sound. So much of the end sonic product of a room is the result the room’s shape and structure, not the choice of loudspeaker as many would think. Unfortunately, churches all too often reach for the “best sounding” (aka best marketed) loudspeaker, and the result is less than hoped. A less costly loudspeaker, properly placed in a well-treated room, will allow your loudspeaker to do what it does best – deliver sound to the listener – while having the room do less of what it is good at: adding many more “out of time” arrivals at the listener’s ear. We end our series on video post-production and delivery, talking about storage and delivery of your content. 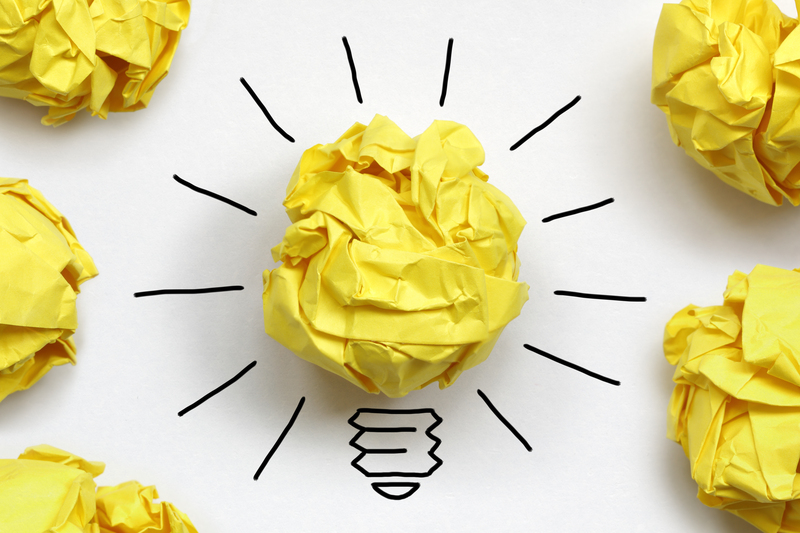 Just like in the previous parts, how you intend to use your content will ultimately determine the delivery method, and storage that will work for you. The biggest challenge I see with churches embarking on a video ministry for the first time, is that they don’t have a process as all. This is mostly because it started with a volunteer, and his or her personal rig (for shooting and editing.) It evolved into a team, but the source content became scattered. “Who has the clip of the guest speaker from last Sunday,” you ask? “Oh, that’s on Jeff’s computer – he’s out of town on business.” Of course, that’s the content that your pastor asked specifically for in this weeks’ video news segment. 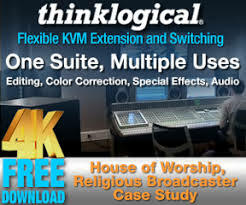 For most houses of worship, the biggest concern when adding any type of new gear to your facility is budget. Sometimes, trying to match what tech you want or think you need to actual money available can be overwhelming. Barry Carter, the owner of The Church Nerds feels your pain. Barry works as an integrator full-time with churches to get them what gear they need with the budget they have. 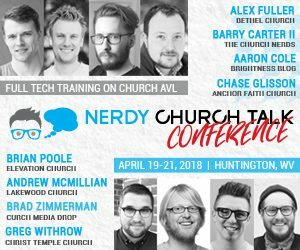 He is also putting together the Nerdy Church Talk Conference, a full three-day Church AVL conference geared towards empowering the local church through Audio, Video and Lighting. Join with speakers from Elevation Church, Bethel Church, Lakewood Church, The Church Nerds and more in over 40 breakouts and five general sessions that include a full worship set by an Integrity Worship Artist. No matter the position you hold or volunteer in, you will walk away with a stronger foundation to help carry out the vision of your church or ministry. 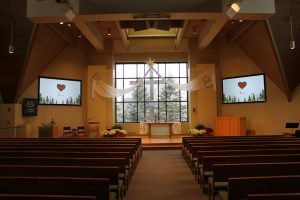 A house of worship’s purpose is to bring people together to share a positive message about faith, and when a facility is able to serve its members more effectively using technology, it translates to higher attendance and positive word-of-mouth – keeping current members coming back and encouraging new ones to join. 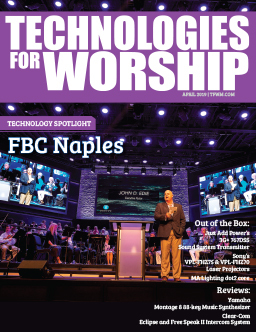 To meet these goals, many houses of worship constantly reevaluate their technology lineup to ensure it successfully engages the community and benefits the staff, and as new offerings hit the market, it’s important to understand the advantages of breaking away from the status quo. Let’s start with a quick definition of “Video on Demand”. 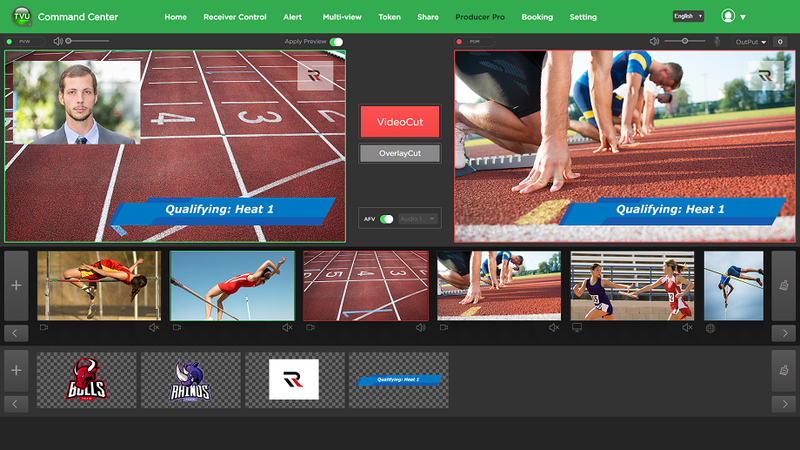 Video on demand (VOD) is a system that allows users to select and watch video content when they choose to, rather than having to watch at a specific broadcast time. This can be available to people on some TV’s, computers, tablets and mobile phones. 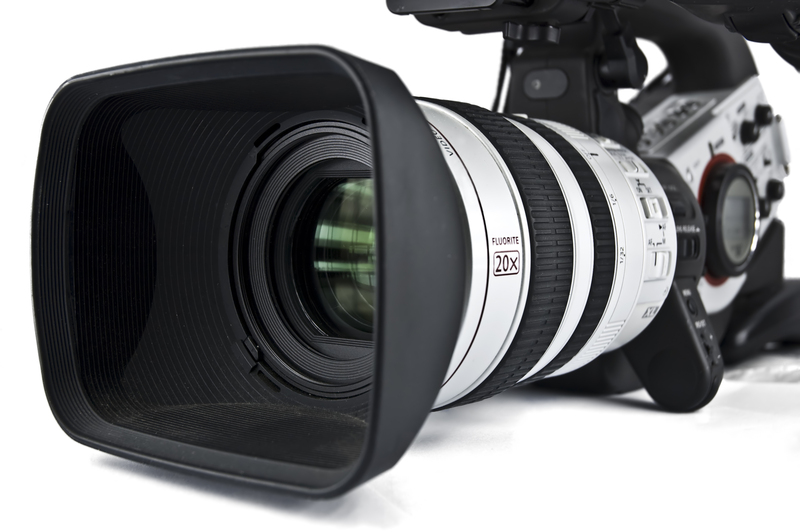 Deciding what video you want to make available largely depends upon your intended audience. This series is not going to address this in detail; however, let me put a few things out there for you to consider. 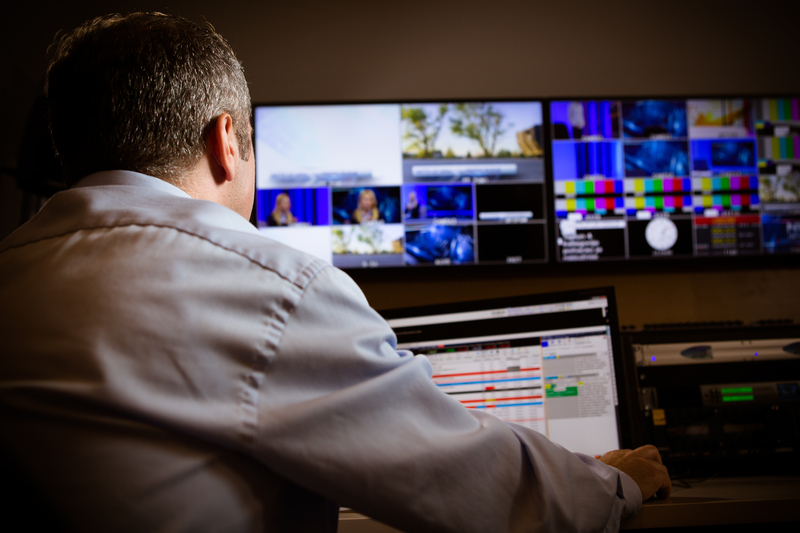 Possible video on demand for your church could include; complete services, partial services, such as a worship & music video or the pastor’s message only. Because people tend to not watch long programming online, you might want to create a service highlight video that has a link to the complete service. Other options are special videos highlighting any number of things, such as special services, information on specific ministries within the church or even short vignettes that communicate a certain message. The options are really endless. Trinity Lutheran Church was first formed in 1932, and moved to our current site in 1952, when the lower level of the present facility was built. Over the years, the structure changed as additions were built and remodeling occurred. With the completion of the Great Hall wing and several new classrooms in 2007, our church became better equipped to serve the ever-growing membership and ministry needs of our congregation. Our mission statement is to welcome all to worship joyfully, grow in faith and Serve near and far in Jesus’ name.